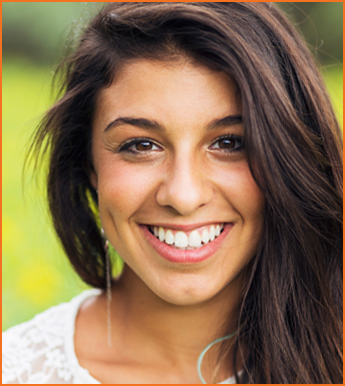 Confidently and proudly show off your new, elegant smile after visiting HAPPY DENTAL P.C. in Phoenix, Arizona. We offer cosmetic dental options to restore your beautiful smile including veneers,all porcelain crowns, white fillings, invisalign, Spa Dent Naturals bleaching and more! Instead of unappealing silver fillings that stand out, we put in fillings that look just like your natural teeth. The old filling or decay is removed and a white composite filling is placed and cured with a special light. The final step entails making a few adjustments and polishing. Patients missing a single tooth or multiple ones should consider an implant and crown resembling their other teeth to fill the gap. If you are missing most or all of your teeth, the All-on-4™ technique allows us to permanently replace them for a full mouth restoration in the same day! Patients missing a single or multiple teeth may chose a permanent bridge usually made from metal and porcelain. Dr. Carter prepares the adjacent teeth where the bridge will attach and an impression is taken and sent to the lab. A temporary bridge will be placed while the permanent bridge is being fabricated by the lab..Shortly thereafer the bridge will be permantly cemented to restore your beatiful smile and function. If the decay or fracture is too large to be restored with a filling or the tooth was treated with a root canal then the tooth must be prepared for a crown to prevent further damage or fracture usually made from metal/porcelain or all porcelain. The tooth is shaved down enough to create room for the crown and sometimes requires a build-up made from a resin material if the fracture or decay is too large and then an impression of the prepared tooth is made. The impression of the prepared tooth is sent to the lab for fabrication of the permanent crown. A temporary crown is then placed until the permanent crown is fabricated. The permanent crown is then fitted precisely and a few adjustments made before permanently cementing. When a tooth is infected or decayed too deep and possibly causing you pain, a root canal is necessary to avoid having it pulled. We make every effort to save your original tooth by removing the nerve tissue and eliminating your pain. Additionally, you will need a crown to protect against fracture. If the tooth decay is too large to be saved with a crown, tooth is fractured severly, severe periodontal disease or pain then removing the tooth is an option. Patients having extensive periodontal disease or severe decay may be a candidate for full mouth extractions and a denture placed on the same day of the extractions! After a comprehensive dental exam an impression is taken and sent to the lab to have the denture processed which will be placed on the day of your extractions. If you are already missing some teeth or all your teeth or not happy with your existing prosthesis then a partial removable or full removable denture is a wonderful option. Patients that have severe bone loss, heavy plaque, tartar and calculus deposits from either genetic or years of neglect will need a deep cleaning. This procedure is performed using hand scalers and an ultrsonic device which cleans deep under your gum tissue. This procedure may be accomplished using a topical numbing agent however in severe periodontal cases a local anesthetic will be necessary. Following this treatment the patient will follow a 3 to 4 month maintenace program. *HAPPY DENTAL P.C. accepts MasterCard™, Visa™, Discover™, American Express™, CareCredit™, and cash as forms of payment. We also accept AHCCCS.